Unlike your child or your spouse, your dog suffers illness in silence. 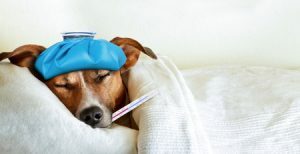 Your poor pup can’t tell you if he’s running a fever, so it’s up to you to watch out for common warning sings. You know how you just want to lie in bed when you’re sick? Your dog is the same way. If she’s reluctant to go for walks, seems uninterested in treats or is moving around much less than usual, she could have a fever. These include red eyes, warm ears, a warm and dry nose, shivering, coughing, panting, vomiting and loss of appetite. The only surefire way to know whether your dog is sick is to get out the thermometer. Use an ear or rectal thermometer made especially for dogs. While your dog may feel a little warm to the touch, that doesn’t necessarily mean she has a fever. Dogs naturally run a bit hotter than humans—a healthy internal temperature for dogs is between 99.5 and 102.5 degrees. If your dog’s temperature is higher, you’ll want to call your vet right away. Thinking about adding a canine companion to your family? Check out Pauley’s Pups, where you can meet a selection of sweet, friendly puppies and toy breeds. Contact us at 804-798-7877 to learn more or visit us today!